Chocolaterie Stam is the new sweet stop in Uptown Westerville. It is one of three domestic locations for the Dutch chocolatier. 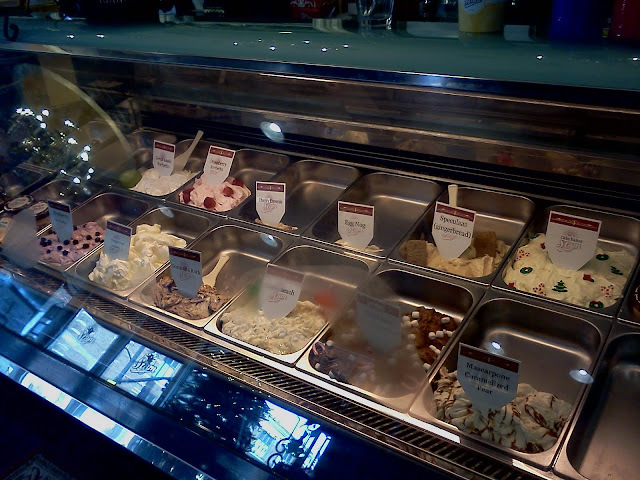 In addition to truffles and assorted candies, Stam also makes gelato. Flavors included chocolate, chocolate hazelnut, blackberry, raspberry, eggnog and peppermint. Flavors rotate with the season. Candies, syrups and fruit are hand stirred into the dense dessert. The chocolate hazelnut gelato, called Donatella, was delightful. It was tan rather than the customary brown color of most chocolate ice cream. Ribbons of hazelnut add a rich layers of flavor to an Italian classic. The milk chocolate at Stam is sweet and creamy. The dark chocolate has subtle roasted bitterness that marries nicely with nuts. Stam also makes sugar free chocolate bars and candies, including toffee. Although there is already a Graeter's in Uptown Westerville and Schneider's, the 24-hour donut shop, Chocolaterie Stam's candies gives greater variety for Westerville residents with a sweet tooth.